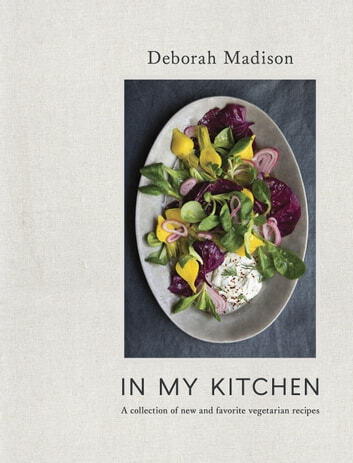 Deborah Madison's newest book shares 100 beloved and innovative recipes from her vast repertoire, all pared down to the key ingredients needed to achieve delicious, nuanced flavor, with simplified preparations. In My Kitchen is a vegetable-forward cookbook organized alphabetically and featuring recipes like Roasted Jerusalem Artichoke Soup with Sunflower Sprouts; Fennel Shaved with Tarragon and Walnuts; and Olive Oil, Almond, and Blood Orange Cake. With dozens of tips for building onto, scaling back, and creating menus around, Deborah's recipes have a modular quality that makes them particularly easy to use. Perfect for both weeknight dinners and special occasions, this book will delight longtime fans and newcomers to Madison--and anyone who loves fresh, flavorful cooking. Filled with Deborah’s writerly, evocative prose, this book is not just the go-to kitchen reference for vegetable-focused cooking, but also a book with which to curl up and enjoy reading. Lavishly photographed, with an approachable, intimate package, this is the must-have collection of modern vegetarian recipes from a beloved authority.